Question: Could you please say something about how to take illness to the path? Rinpoche: We begin by understanding that thoughts about being sick or not being sick-such as thinking, "I am really sick," "I am just a little sick," or "I am not sick,"-are dependently arisen, that is, the idea expressed in one only exists in dependence upon the other. Another way to say this is that such thoughts don't refer to anything truly existent. It is like having experiences in a dream . . . Sickness is not something that truly exists, it exists only in dependence upon our idea that we are sick . . . This is why the yogis in Tibet have a saying, "My body does not get sick, my thoughts get sick." We should use our intelligence to see that "sickness" has no essence. Then rest in that: in the true reality free of thoughts about being sick. 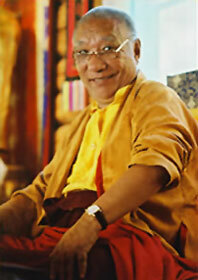 Khenpo Tsultrim Gyamtso Rinpoche, Meditation on Emptiness, Nalandabodhi Publications, 2001, pp. 168-169. Translated by Ari Goldfield (Edited for the Weekly Quote).